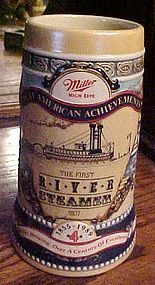 1989 Miller High Life Celebrates Great American Achievements series stein. Fourth 4th stein in the series. Condition is Mint with no chips or cracks. Stein is approximately 7" tall. Carolina Collection. 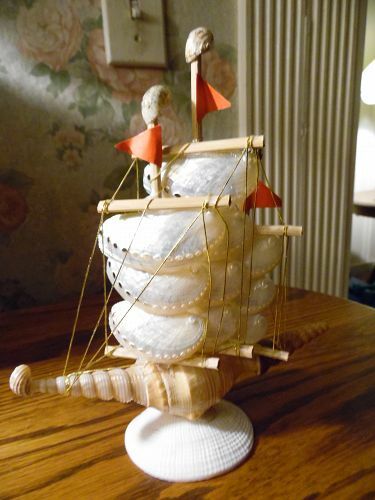 Vintage 1940's wood ship model of a Destroyer by Ship Shape Famous Ships miniature ship models Perkasie, PA. Full size plans with shaped redwood hulls. Box states "This type destroyer has served in two wars. 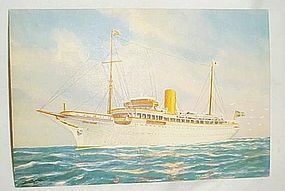 These were the ships that kept the Atlantic open in the dark days after Pearl Harbor". Everything intact and ready to assemble with instructions. Model S151. 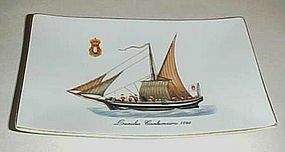 VISTA ALEGRE porcelain dish representing a former military Gunboat 1798) with the brand of "Maritime Museum - Lisbon on the back. Measures 4 1/4" x 6 1/2". Perfect condition, gold edge trim. 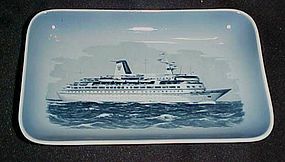 Blue and white porcelain souvenir dish or tray featuring The cruise ship CROWN ODYSSEY from the Norweigian Royal Cruise Line in the 1980's. Underside marked - ROYAL COPENHAGEN DENMARK with initials and symbols. 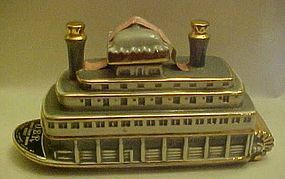 I believe this is a tip or pin tray or dish. 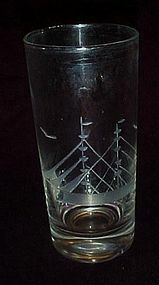 Measures 3 1/3" x 5 1/8". Perfect condition with no damages. This lovely decanter was produced by Jim Beam in 1963. 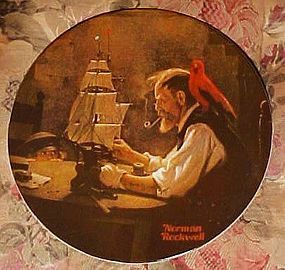 It features a painting of Dutch sailing ships (in blue and a reddish hue) on the front and on the back an embossed windmill scene, and some refer to it as The Windmill Bottle. It is made of opaque glass, measures approximately 13 inches high. The bottle is beautiful, curvaceous and detailed,and in perfect condition, making a wonderful addition to any collection! 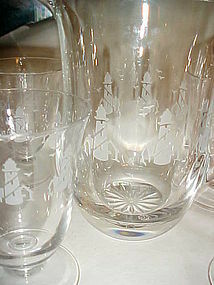 Unknown to me who the maker of these lovely glasses are. Heavy bottom and made of crystal. Cut pattern of a clipper sailing ship with seagulls flying. Measures 6 1/4" tall and in perfect condition. I have 5 available. Price is for each. 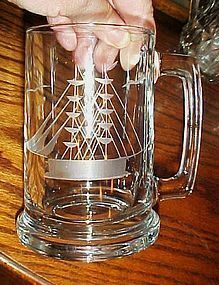 Great for that old pirate and his nautical themed bar. Take a look at this wonderful large plate or round platter. 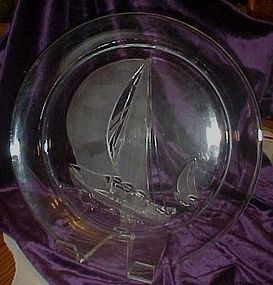 Measures 13 3/4" in diameter and is made of heavy thick glass with frosted reverse cut outs of sailboats. Nice and deep 1 5/8". No chips or cracks, but there are a couple of scratches over the smaller boat from the reverse side. 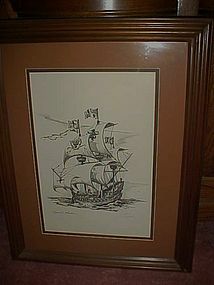 Would be a wonderful serving platter for a nautical themed kitchen. Not sure of the maker. I thought it may have been made by Fostoria. A great figural whiskey decanter by OBR. All original stickers and seals. Decanter is green with lots of gold trim, and is empty. Someone has marked 1968 date on the bottom. Nice condition with no chips or cracks. Measures 5 3/4" tall and is 10" long. 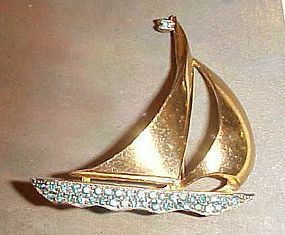 This is a nice paddle boat with the name River Queen. 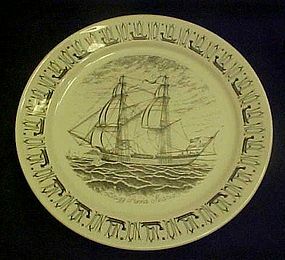 Compliments of Norwegian American Line, this heavy china plate features a Norwegian sailing ship from the 18th C, Anna Maria. Her history is on the back. 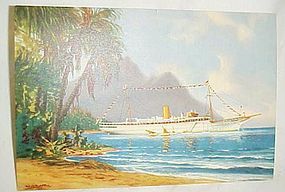 We guess this is from a series given to or bought by cruise patrons as a souvenir. The border of viking ships and NAL monograms are especially nice. 10 1/2 inch diameter. Made by Porsgrund Norway, Circa 1960's. Pristine condition. No dings, chips, cracks, repairs, utensil marks or wear. I have 2 available. Price is per plate.